DID YOU KNOW THE ISLAND GRILL CATERS? That’s right we are not just a restaurant with delicious food and a favorite local hangout in Fort Collins, we also cater to your every need. Need a large space to throw a party? Call The Island Grill. We have plenty of room to accommodate your group and we’ll put out a delicious spread that will make everyone’s mouth water. Having a party, meeting, casual get together, reunion, or a wedding? 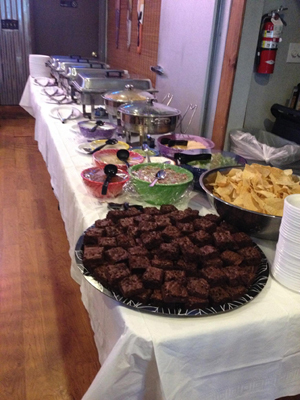 The Island Grill can also cater your event off-site. We have many years of catering experience and we're on many local preferred caterers’ lists like The Lincoln Center in Fort Collins. Can’t decide where to have your outdoor event? How about a beautiful tropical island right here on the Front Range? The Island Grill is an exclusive caterer for Island Promotions LLC in Fort Collins (5905 South west Frontage Rd. Fort Collins CO 80526. 970-225-6666 Ext. 47). Take a look at the catering menu while you are browsing our website. If you see something you like we’ll be happy to prepare that particular menu for your gathering at The Island Grill, or deliver and staff your off premise event. If our prepared catering menu isn’t exactly what you’re looking for don’t worry. The Island Grill will work with you to come up with a specific catering menu to fit your needs. Book your holiday party now through October 31st and receive 10% off the food. So sit back, relax and let us do the work. A party with The Island Grill is like a slice of paradise.